Virginia Wesleyan’s Undergraduate Research Program offers research and conference grants to student-researchers. Research grants covers costs associated with conducting research (e.g. equipment and archival travel). Conference grants fund travel and lodging costs associated with presenting a completed research project at an off-campus conference. 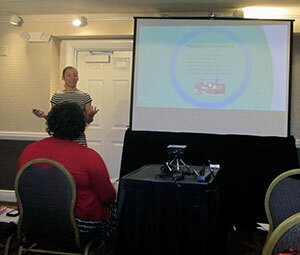 Virginia Wesleyan's Undergraduate Research Program is pleased to accept proposals from individual students or groups of students to attend academic conferences. In recent years, conference grants have ranged from $50 to $1,000. In only rare circumstances does the Undergraduate Research Program award over $1,000. As you put together your application, we encourage you to be as economical as possible. We also encourage you to seek other funding sources, particularly for expensive conferences. Please Note: Applications for conference travel that involve airfare must be received at least 8 weeks prior to the conference to be considered. Please read the descriptions of the conference grants listed below carefully to ensure that you submit the correct application. Submission of an incorrect application will delay a response. Students seeking financial support to travel to academic conferences to present their research may apply for a conference presentation grant. The research may be presented as either a talk or a poster. This particular application is for research projects that were undertaken by either individual students or groups of students. The Undergraduate Research Program accepts proposals from individual students to support travel to attend academic conferences. In most cases, the maximum award is $250 to cover travel, ground transportation, accommodations, and the conference registration fee. Dining expenses will not be supported. Any cost overruns will be the responsibility of the student unless specifically cleared by the Undergraduate Research committee. The Undergraduate Research Program accepts proposals from groups of students/faculty to support travel to attend academic conferences. In most cases, the maximum award is $250 per student to cover travel, ground transportation, accommodations, and the conference registration fee. Dining expenses will not be supported. Any cost overruns will be the responsibility of the students or the students' department unless specifically cleared by the Undergraduate Research committee. The project must meet the Undergraduate Research Program's definition of independent research. The project must be endorsed by a faculty member. The student must be enrolled at Virginia Wesleyan University and show evidence of continuing enrollment at Virginia Wesleyan University or graduate school for the following semester. In recent years, research grants have ranged from $50 to $1,000. In only rare circumstances does the Undergraduate Research Program award over $1,000. The grant may be used to cover research materials or expenses related to travel. Dining expenses are not supported. As you put together your application, we encourage you to be as economical as possible. We also encourage you to seek other funding sources. Please Note: Applications for that involve airfare must be received at least 8 weeks prior to the travel to be considered. Meet with the Director of Undergraduate Research, Dr. Soraya Bartol, soon after the announcement of the award. Email Dr. Bartol (sbartol@vwu.edu), to set up an appointment. Submit a copy of your paper/poster to Dr. Bartol. You may email the paper/poster. Make all financial arrangements for the grant through VWU's Business Office with Ms. Midge Zimmerman. You may contact Ms. Zimmerman at mlzimmerman@vwu.edu. Submit an itemized expense record using this form. This is by the end of the academic term. Submit 3 or 4 pictures of yourself, active in the research. These pictures might be used for publicity. Email the pictures to Dr. Bartol (sbartol@vwu.edu). It is expected that all students who receive financial support from the Undergraduate Research Program present at Virginia Wesleyan University Port Day.